Seeking adventures and big money? 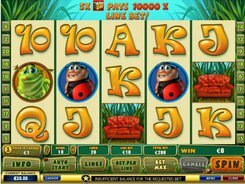 Diamond Valley Pro powered by Playtech is a well-rounded video slot machine with a 10,000-coin jackpot opportunity! 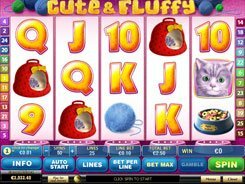 The 5 reel slot game has 20 win lines. The bottom coin value is 1 cent and the top – $5, with a 1 to 10 range of coins per line. So the maximum bet can hit a stunning $1000. The Tequila (wild symbol) helps generate winning combinations substituting for other icons. Two and more wilds on an activated payline will bring you the win of x15 the bet. 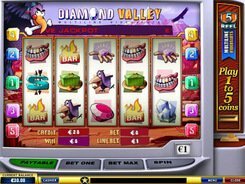 The Vulture is the scatter symbol in the Diamond Valley Pro slot machine. Two or more Vultures appeared anywhere in the reels pay 1 to 200 coins. The Diamond Bonus icon can roll up on reels 1 and 5 bringing you the 4x time your total bet. In addition, you will have to choose one of the three characters: a fearful Cowboy, an old Indian and a nice Lady. 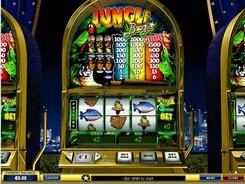 You rescue the selected person and he or she hands you in 12, 15 or 20 free spins. 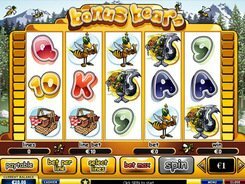 Besides, the rescued character offers you a bet multiplier for the on-coming free spin round. Choose his/her right or left hand to unveil the multiplier (x3 to x10). Your total winnings can be really fantastic! PLAY FOR REAL MONEY!